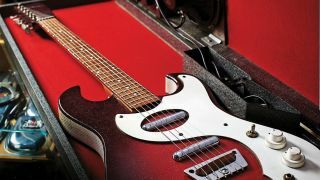 Silvertone’s 1457 model guitar and Amp-In-The Case was originally available in the Sears Roebuck catalogue between 1964 and 1966 and cost around $50. Both amp and guitar were designed by Nathan Daniel, and, if you’re thinking that the lipstick pickups and overall design vibe look familiar, then it should come as no surprise that Daniel was the mastermind behind Danelectro. The guitar has a hollow body with a centre block under the bridge and stacked volume and tone controls for each pickup mounted on the top. The guitar’s nut is made from aluminium and, it’s said, forms an essential part of the inherent ‘Dano sound’. At the back of the guitar there is height adjustment for the pickups via some screws and there is also a neck tilt adjustment similar to that found on 70s Strats. The finish on the body’s sides is weave-patterned vinyl, and down by the jack socket there used to be a clip to secure your guitar cable in place, but that’s missing from our model here. 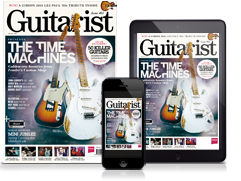 If the guitar is awash with innovation, then what about the case? A built-in valve amplifier and a ‘Jensen Special Design’ speaker was all part of the deal, with a special pocket reserved to store a footswitch that would turn the amp’s tremolo unit on and off. Despite being designated a cheap instrument, we’re told by collectors that the guitar is actually a very nice one to play and has even been seen in the hands of The Stones’ Mick Jagger. Guitar courtesy of Guitars: The Museum, Umeå.